How Do I Make Natural Protein Shakes? If your doctor has advised you to up your protein intake to put weight back on after an illness, or you just want to bulk up your muscle mass without consuming additives and fillers found in commercial protein shake formulas, learn how to make natural protein shakes at home using organic milks, whey protein and fruits. 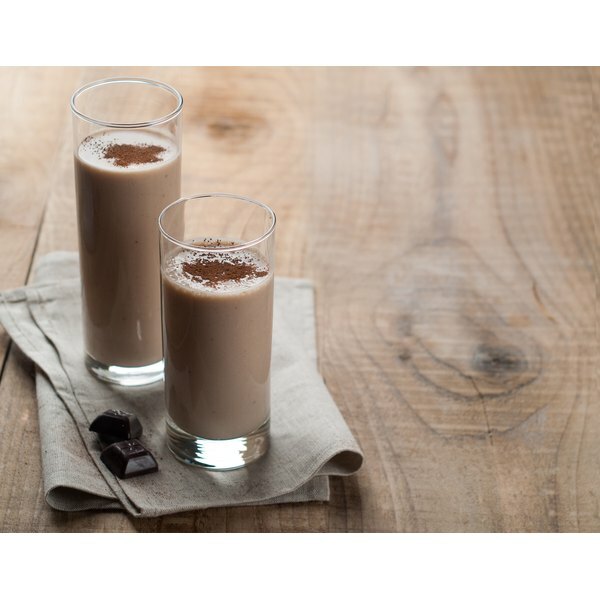 You can drink the natural protein shakes for breakfast, between meals and after workouts to build healthy, lean muscle. Make one serving of organic whey protein according to the package's directions, and pour into a blender. Add five to seven diced organic strawberries, one diced organic kiwi and about 1/2 cup of ice to the blender. Blend on low speed for about one minute, and drink or serve immediately. Pour 2 cups of organic soy milk into a blender. Add one diced organic banana, 2 tablespoons all-natural peanut butter and about 3/4 cup of ice to the blender. Blend on high speed for 45 to 60 seconds, and drink or serve immediately. Pour 1 1/2 cups of organic almond milk into a blender. Add 1/2 cup cooked organic oatmeal, 1 teaspoon of organic honey and about 1/2 cup of ice to the blender. Blend on low speed for 30 seconds, and then take the top off and run a rubber spatula around the sides and bottom of the blender to remove any oatmeal or honey stuck to the blender. Blend for an additional 30 seconds, and drink immediately. Pour 2 cups of almond or soy milk into a blender. Use a sharp knife to roughly cut 1 1/2 ounces of unsweetened organic chocolate, and add the chopped chocolate to the blender. Dice three to four organic dates, and add them to the blender. Add about 3/4 cup of ice to blender. Blend on low speed for 30 to 45 seconds, then use a rubber spatula to rub off any chocolate or date residue from the bottom and sides of the blender. Blend on low speed for 30 additional seconds, and drink or serve immediately. Pour 2 cups of almond milk or prepared organic whey protein into a blender. Add 1/2 cup organic raspberries and 1 teaspoon organic agave nectar to blender. Blend on low speed for 45 seconds, and serve.